In recent weeks, its been Amazon making all the noise. Today the company unveiled a new Kindle, the larger Kindle DX. The DX is 77% bigger and 36% more expensive, and everyone is falling all over themselves to explain why it won’t save newspapers. Of course the Kindle alone won’t save newspapers – the problems there run deep – but it might be a passable way to read the paper (if you’re the kind of person who spends $489 on a newfangled newspaper reading device). The new larger screen, 9.7 inches on the diagonal, certainly helps, as does the “auto-rotating” screen, which lets you flip from portrait to landscape. The bigger display and other features like the ability to “clip and save” articles are all designed for what Amazon is calling an “Enhanced Newspaper Reading Experience.” It also occurs to me that the Kindle demographic might align with what’s left of the newspaper demographic in a way that will offer a small ray of sunshine during these otherwise dark times. But it’s also true, as Patrick noted at his Vroman’s blog today, that the iPhone is a quite capable for reading the news (as are most other smartphones; that’s the whole point of a smartphone). 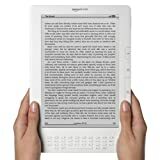 What’s much more interesting than the newspaper angle – and somewhat frightening in fact – is that Jeff Bezos today announced that among books that are available for the Kindle, 35% of the copies Amazon sells are Kindle editions. This is a surprising number (at the Kindle 2 unveiling in February it was 10%) and is further proof of the huge land grab that Amazon is now enacting. Only slightly mitigating those sales figures is news that the DX will support the commonplace PDF format, leaving the door open for a future in which most ebooks sold can be read on any reader, no matter what company manufactures it. Amazon has also been making waves on the device agnostic side of things with last month’s purchase of Stanza, the popular free ebook application for the iPhone. Amazon had already unveiled a Kindle app for the iPhone, and this move further solidifies its presence there (and presumably in the app-centric ecosystems of future smartphones). The Kindle itself, of course, is the main focus. The longer that Amazon can keep its hands on the ebook market (a market that will eventually embrace open formats, one has to assume), the longer Amazon can rake in its monopoly profits. The iPhone moves, as well as the decision to support PDFs on the DX, meanwhile, are a smart hedge and a tacit acknowledgment that ebooks will one day be predominantly sold in formats that aren’t tied to any one device. Science fiction author and Boing Boing blogger Cory Doctorow explains why science fiction writers should be excited that theirs is the “only literature people care enough about to steal on the Internet.” Doctorow has made his books freely available on the Internet – while also selling copies through traditional channels – and has been impressed by the results:I’ve discovered what many authors have also discovered: releasing electronic texts of books drives sales of the print editions. An SF writer’s biggest problem is obscurity, not piracy. Of all the people who chose not to spend their discretionary time and cash on our works today, the great bulk of them did so because they didn’t know they existed, not because someone handed them a free e-book version.The full column is available at Locus Online. For my thoughts on these topics a good place to start is here. Do you think that other, larger newspapers are getting the same revenue split from Amazon? Also, I wonder how the 35% that Bezos cited breaks down between the Kindle and the iPhone app, which was introduced during the time period over which the increase took place. It’s not uncommon for a website based in Russia or Italy or Venezuela to link to The Millions. Keeping up with these mentions and trying to figure out how somebody in Milan or Caracas is reacting to an essay or review of ours has made me a frequent user of Google Translate, which lets you drop in a block of text and press “translate.” In ever magical Google fashion, a passable English translation appears. What’s interesting to me is that over the last few years the translation seems to have become more passable and it’s now easier than ever for me to glean meaning and intent from the product of Google’s machinations. If one assumes that the improvement in quality of these translations might continue in a linear fashion, then it follows that I might be reading a machine translated book one of these days. It’s a liberating notion. I have no affinity for languages but I have often wished I could dig into to the untranslated oeuvres of favorites like Alvaro Mutis or Ryszard Kapuscinski or read their translated books in their original forms. But then again, the idea might inspire fear that some essentially human quality of the literature would, literally, be lost in translation. And certainly for translators, who would be replaced by stacks of processors in a climate-controlled warehouse somewhere, such a development would be devastating. Even if computers never approach the craftsmanship of Natasha Wimmer and Edith Grossman, Google or something like might get good enough at doing the heavy lifting and letting the reader clean up the language here and there. And indeed that might be fine for some applications even today, but using Google to create a passable translation of the blog posts of a Spanish or German blogger is one thing, using it to translate a work of literature is quite another. A translated novel needs to be perfect and Google’s success in completing undemanding translation tasks was no guarantee that it would be able to manage the nuanced language of a literary master. An experiment was in order. In the interest of seeing how close we are to this brave new world of machine translation, I decided to give a recent work of fiction, written originally in Spanish, the Google test. I chose Roberto Bolaño’s 2666 because I haven’t read it and because I was able to find the same excerpt in both English and Spanish. The first time Jean-Claude Pelletier to read Benno von Archimboldi was at Christmas 1980 in Paris, where a university student of German literature at the age of nineteen. The book in question was D’Arsonval. The young Pelletier knew then that this novel was part of a trilogy (consisting of the garden, full English, leather mask, Polish theme and D’Arsonval was obviously French theme), but that ignorance or the vacuum or the neglect literature, which could only be blamed on his extreme youth, it detracts from glare and admiration that led to the novel. The first time Jean-Claude Pelletier read to Benno von Archimboldi was Christmas 1980 in Paris, where he was a nineteen-year-old university student of German literature. The book in question was D’Arsonval. The young Pelletier knew then that this novel was part of a trilogy (consisting of the garden, full English, leather mask, Polish themes and, obviously, French themes as well), but beyond that his ignorance or a vacuum or neglect for literature, which could only be blamed on his extreme youth, detracted from glare and admiration that he would have for the novel. I decided that Pelletier is the nineteen year old and that Google’s muddled translation was trying to tell me that the young Pelletier is reading to this Archimboldi and though Pelletier had some rote understanding of the book D’Arsonval, he was too immature to appreciate it as he one day would. The first time that Jean-Claude Pelletier read Benno von Archimboldi was Christmas 1980, in Paris, when he was nineteen years old and studying German literature. The book in question was D’Arsonval. The young Pelletier didn’t realize at the time that the novel was part of a trilogy (made up of the English-themed The Garden and the Polish-themed The Leather Mask, together with the clearly French-themed D’Arsonval), but this ignorance or lapse or bibliographical lacuna, attributable only to his extreme youth, did nothing to diminish the wonder and admiration that the novel stirred in him. Pelletier is indeed the youth here, but he didn’t read to Archimboldi, he read a book by Archimboldi. Worse, Google and I totally misread Pelletier’s reaction to the book. We find that Pelletier, despite his youth, indeed appreciated D’Arsonval on a gut level, but did not yet appreciate its literary context, essentially the reverse of what the machine translation came up with. And Google and I totally flubbed the idea that the parenthetical list was a list of titles and not descriptors for D’Arsonval. Natasha Wimmer, your job is safe. Despite my failed experiment, machine translation might one day be able to figure out how to properly align those pronouns and antecedents and it might make short work of that complicated list of book titles, but would a machine ever, as Wimmer has, be able to convey the urgency in Pelletier’s literary discovery?